Rope pull switches are also emergency stop devices. 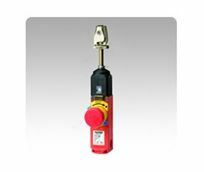 Unlike emergency stop switches, they are used whenever it is necessary to protect large danger areas. It provides redundant safety contacts with monitoring contacts. The RPS switch triggers with increase (pulling) or decrease (severing) in tension of safety cable or pushing of E-stop.